Bula! Meet the world’s friendliest people in the affordable Fiji Islands. A 10-hour, non-stop flight from Los Angeles, the Fiji Islands are located in the Pacific Ocean southwest of North America. Made up of 333 islands, Fiji is steeped in history and rich with tradition. Utterly enchanting, the islands personify genuine warmth, embodied in their tropical climate, idyllic waters and compassionate people. Fijians enthusiastically welcome visitors from around the world with open arms. In Fiji, the most wonderful activity is doing nothing at all; just soaking up the warmth, tranquility and friendliness of a land that is unspoiled, non-commercial, uncrowded – a place that is made for people stressed out by the hectic pace of today’s demanding world. As a visitor, you’ll be treated in Fiji’s timeless tradition as an honored guest. As such, you’ll be embraced by the warmth and simplicity of our people and drawn into their idyllic lifestyle, the gentle pace and ease of which is irresistibly seductive. Golf – Championship courses in Nadi, Pacific Harbour & Suva. Tennis – For all-weather or immaculate grass courts available at most resorts. Canoeing & Kayaking – Find your own private lagoon and paddle the smooth sparkling waters. Parasailing & Ballooning – Fly high above the coastal and island beaches! Water Sports Fun – snorkeling, windsurfing, jet skiing, water-skiing, water scooters, banana boating and sailing a sunfish. Trekking – A one day trek with breathtaking scenery across the highlands to heights of about 3,000 feet above sea level to Yavuna, a quaint little Fijian village. Horseback Riding – Check with your Hotel concierge for Stables for beach, mountain or sunset/moonlight rides. Game Fishing – Arrange everything from deep-sea fishing charters (by day or overnight) to reef, hand line and even night fishing. 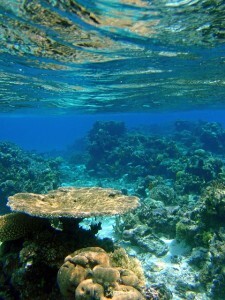 Scuba Diving – Check out the scuba diving page to see why Fiji is one of the top ten dive destinations in the world. Qantas Vacations are the largest purchasers of hotel rooms and tourist services in the South Pacific. This translates into lower rates and savings for you when you’re booking a Fiji Islands vacation. We offer you many new and ongoing travel specials including Fiji Islands travel packages, romantic and luxury getaways, resort and hotel specials, Fiji holiday airfare specials, and much more. Travel to the Fiji Islands and enjoy golf, tennis, canoeing, kayaking, parasailing, ballooning, horseback riding, game fishing and scuba diving. Fiji’s wet season is from November to April, with the heaviest rains falling between December and mid-April. Fiji has a mild average temperature of 25°C, however it can climb to above 30°C in summer (December and January) and sink to 18°C in winter (July and August). The best time to visit is during the so-called ‘Fijian winter’ or ‘dry season’, from May to October. This time of year is more pleasant with lower rainfall and humidity, milder temperatures and less risk of meteorological hazards such as cyclones. Consequently these six months make up the high season, when airfare and accommodation costs are at their highest. Expect costs to peak in June and July. Fiji’s ‘wet season’ is from November to April, with the heaviest rains falling from December to mid-April. This is when tropical cyclones, or hurricanes, are most likely to occur. Strong, destructive cyclones are, however, a fairly rare phenomenon in Fiji. The country has been hit by an average of 10 to 12 cyclones per decade, with only two or three of these being very severe. If you’re travelling during the wet season it’s best to head to drier regions such as the Mamanuca and Yasawa island groups. That said, December and January are also busy months as they coincide with school holidays in both Australia and New Zealand, and Fijians visiting relatives. In February and March, and even November, however, Fiji sees fewer tourists and you’re more likely to get bargains on your accommodation. The temperature during these months is also fairly appealing so you get the best of both worlds. The Diwali Festival is held in late October or early November and can be a fun, if manic time to be in Fiji. 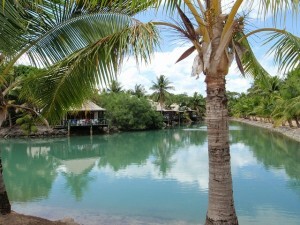 Fijian school holidays can have an impact on accommodation availability. They generally last for two weeks from late April to early to mid-May and mid-August to early September. Summer holidays run from early December to late January. The local currency is the Fiji dollar ($); it’s fairly stable relative to Australian and New Zealand dollars. See inside front cover for exchange rates. All prices quoted herein are in Fiji dollars unless otherwise specified. The dollar is broken down into 100 cents. Bank notes come in denominations of $50, $20, $10, $5 and $2. There are coins to the value of $1, $0.50, $0.20, $0.10, $0.05, $0.02 and $0.01. Even though Fiji is now a republic, notes and coins still have a picture of England’s Queen Elizabeth II on one side. It’s good to have a few options for accessing money – take a credit card, a debit card, some travellers cheques and a small amount of foreign currency. The best currencies to carry are Australian, New Zealand or US dollars, which can be exchanged at all banks. Before you head out to remote parts of Fiji, check in the appropriate chapter to make sure you can access money, exchange currency or change travellers cheques. ATMs are common in major urban areas and most accept the main international debit cards including Cirrus and Maestro. The ANZ bank has an ATM at Nadi International Airport and you’ll find more in town at Nadi and Suva. There’s also one in Savusavu, but have a backup plan (such as travellers cheques) in case it’s out of order. Although they are more commonplace, you won’t find ATMs in remote areas, so plan ahead. Restaurants, shops, midrange to top-end hotels, car-rental agencies, tour and travel agents will usually accept all major credit cards. Visa, Amex and MasterCard are widely used. Some resorts charge an additional 5% for payment by credit card. Cash advances are available through credit cards at most banks in larger towns. You can change travellers cheques in most banks and exchange bureaus, and at larger hotels and duty-free shops. It’s a good idea to take travellers cheques in both small and large denominations to avoid being stuck with lots of cash when leaving. The 24-hour ANZ bank at Nadi International Airport charges $2 on each transaction. Other banks and exchange bureaus don’t normally charge a fee.